The Illinois Craft Brewers Guild and Choose Chicago announced the "Friday Night Flights" series: Six fests, scheduled between June and August, each held in a different neighborhood brewing hub. RAVENSWOOD — Chicago's craft beer scene has grown so large, a single summer fest celebrating the city's homegrown breweries won't do. 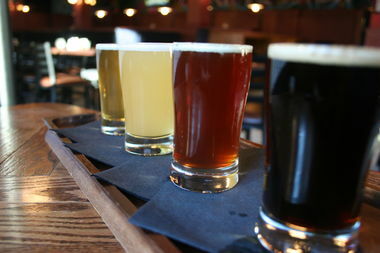 On Thursday, the Illinois Craft Brewers Guild and Choose Chicago announced the "Friday Night Flights" series: Six fests, scheduled between June and August, each held in a different neighborhood brewing hub. How it will work: Buy a sampling pass in advance for $15 (or $20 at the door), get 10 three-ounce pours in return. Food will be available for an additional cost ($5 per item). Group passes — $80 for six — can also be purchased. All events take place 6 p.m. to 9 p.m., rain or shine, and will include local entertainment. • June 2; Pilsen, Bridgeport and Pullman; 2700 block of South Eleanor Street, outside The Duck Inn. Participating breweries: Mad Mouse, Lagunitas , Marz, Argus, Whiner, Lo Rez and Alulu Brewpub. • June 16; Milwaukee Avenue's "Hipster Highway"; Wicker Park, Bucktown, Logan Square and Avondale; 2700 block of North Milwaukee Avenue. Participating breweries: Piece, Pipeworks, Revolution, Hopewell, Aleman and Lake Effect. • July 7; Lincoln Park and Lakeview; location TBD. Participating breweries: Dryhop, Burnt City, Greenstar, Corridor Brewery & Provisions, Andersonville Brewing, Goose Island-Clybourn. • July 21; Loop, South Loop and Bronzeville; 2300 block of South Indiana Avenue; the Original Chicago Blues All Stars set to perform. Participating breweries: Vice District, Motor Row, Baderbrau, Rock Bottom, Eataly's Birreria and Gino's East. • Aug. 11; West Loop and West Town; 300 block of North Sangamon Street. Participating breweries: Goose Island, Haymarket, Forbidden Root, Cruz Blanca Cerveceria, On Tour Brewing Company, All Rise, Illuminated Brew Works, Great Central Brewing and Finch Beer Company. • Aug. 25; Ravenswood's new Malt Row; 4700 block of North Ravenswood Avenue. Participating breweries: Begyle, Half Acre, Spiteful, Dovetail, Band of Bohemia, Old Irving Brewing, Maplewood and Alarmist.